Colorado Mountaineering: Pyramid Peak: Are We Just Mountain Goats? Pyramid Peak: Are We Just Mountain Goats? If I had to pick two words to describe our climb of Pyramid Peak on 9/6/12, it would have to be…mountain goats. They were everywhere. 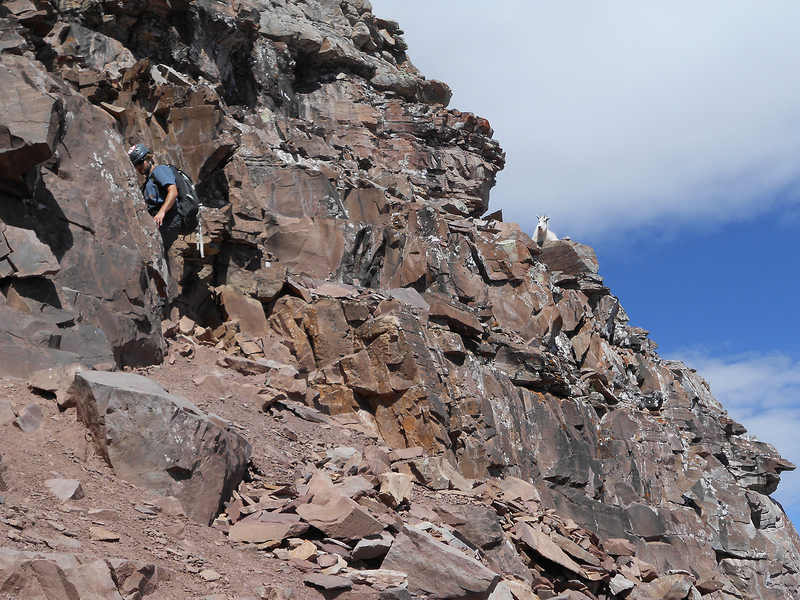 And at times, picking our way up Pyramid's long, broken ledges, we felt not so much different. 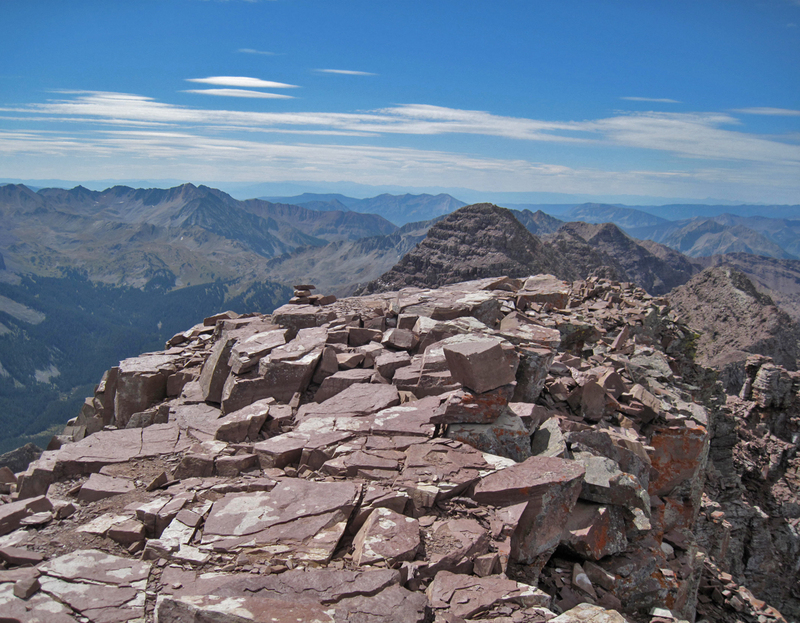 Pyramid Peak is considered one of Colorado’s hardest fourteeners. 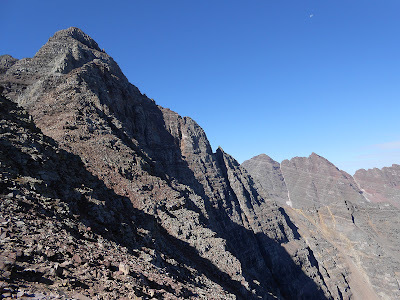 Though we had basically given up our chase of the fourteener list and decided instead to create our own list of mountains we wanted to climb, it is hard living in the shadow of the Elks not to be drawn to them. 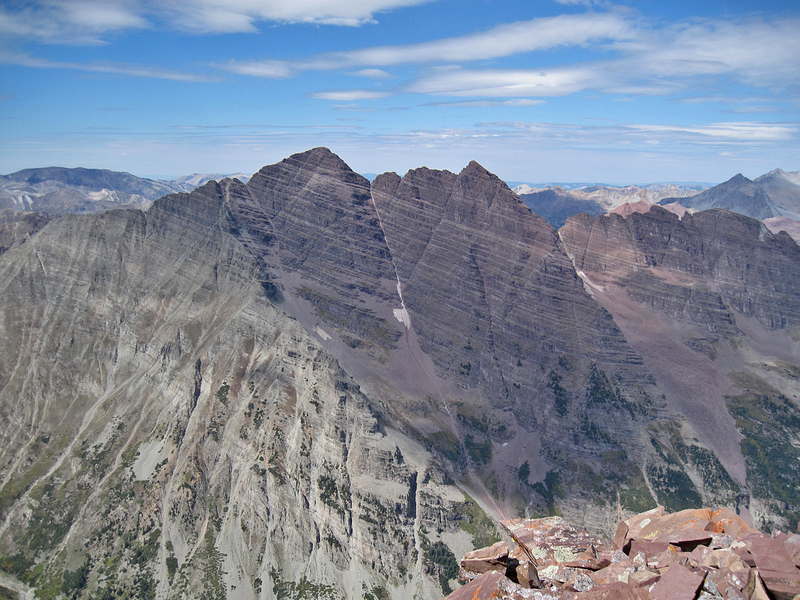 We had climbed quite a few Elk Range favorites, including Capitol, Snowmass, Castle, Conundrum, and Mt. Sopris. The time had come for us to take on Pyramid Peak. 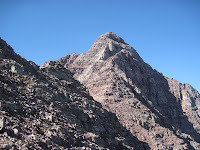 Pyramid is not a particularly difficult peak to climb. Its reputation comes instead from its rock, which is some of the worst in the state. It is a steep mountain, and at times you feel like nothing below you is consolidated and that all of it is just waiting for the right trigger to collapse. 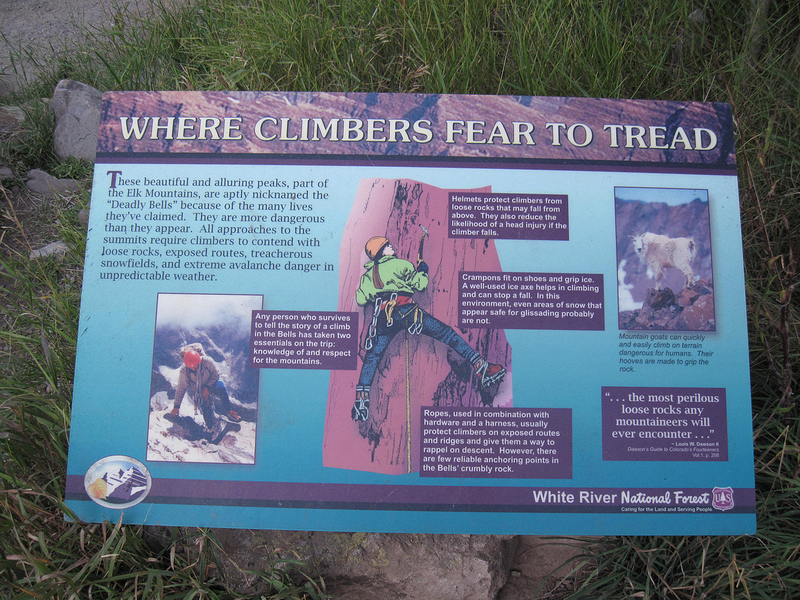 It had been a difficult year for climbers already in the Elks. 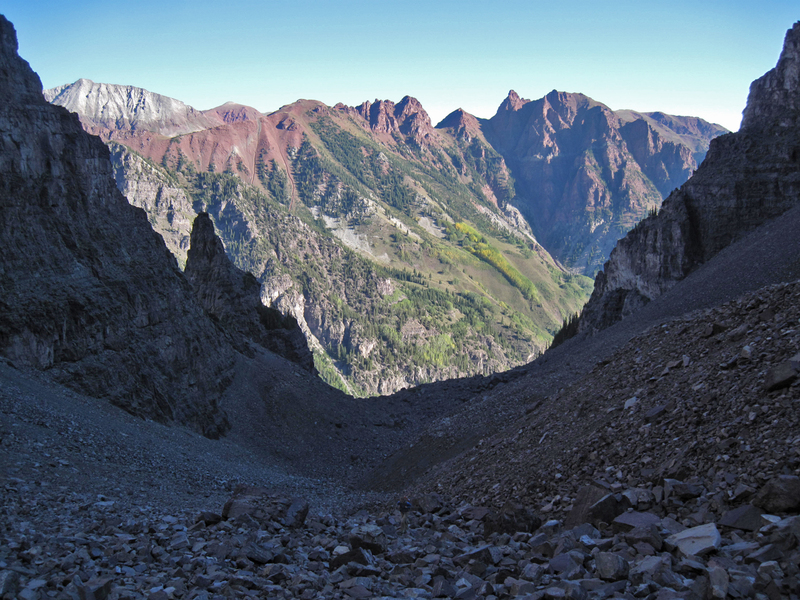 There had been several deaths and rescues on the Maroon Bells and a recent death on the saddle between Hagerman and Snowmass Mountain. 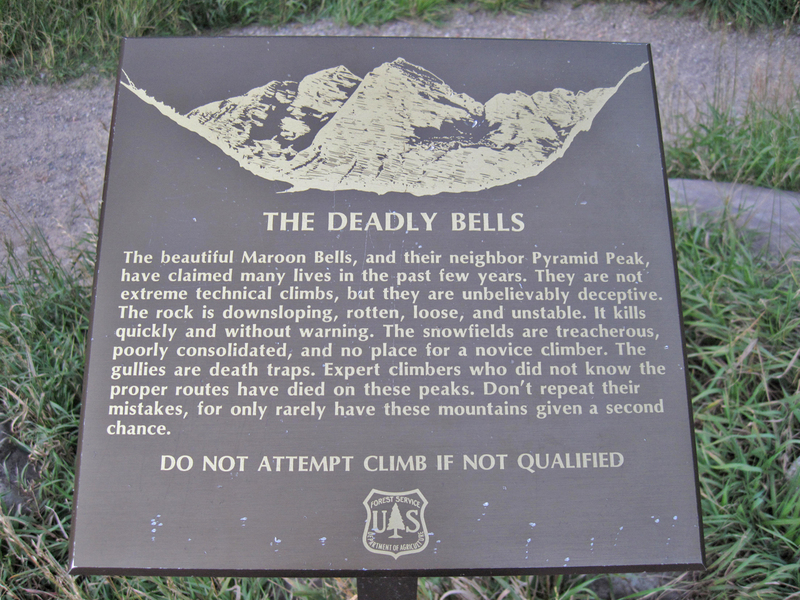 This is nothing usual really; the Bells have earned themselves the moniker “The Deadly Bells” due to the inordinate number of people that have lost their lives on them over the years. 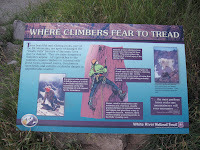 All of this inevitably leads to a particular reputation amongst not only the 14er crowd but also the non-climbing community as well. The Maroon Bells: cherished for their beauty, feared for their deadly history. When you arrive at Maroon Lake and hike past the two warning signs, it is hard not to think of all the people who started this journey and did not return. Two summers before a teenager lost his life with his father while doing the Peak-to-Peak traverse. I was on Snowmass that very day. Five or six years earlier a friend of mine died on Maroon Peak on his 27th birthday. 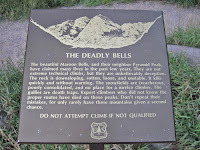 Many of these victims of the deadly Bells were experienced climbers. While I had always heard that for a careful and knowledgable mountaineer neither the Bells nor Pyramid are particularly difficult, the objective risk on mountains such as these always leaves open the possibility of unknown and uncontrollable hazards. It was a bit of a late start. We started up the familiar trail around Maroon Lake a little before 7 am. 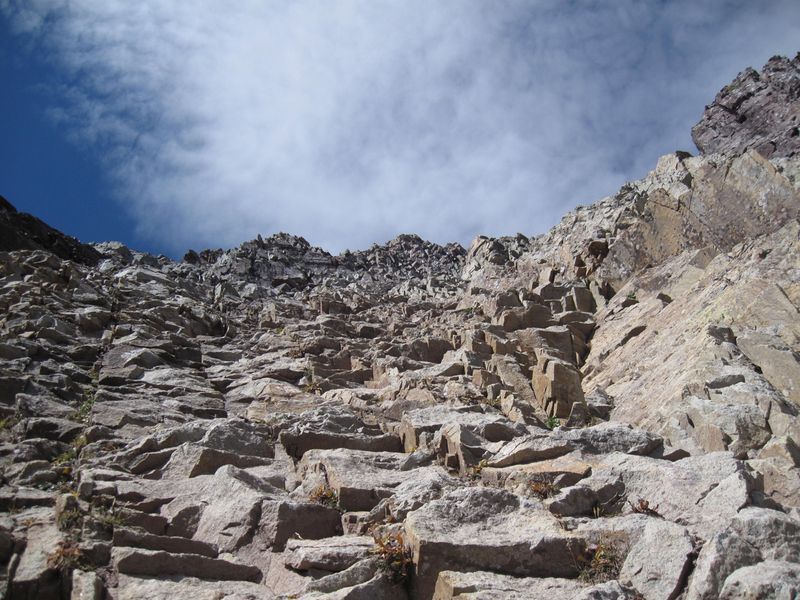 Considering that only a month before when we’d climbed the North Face of Longs Peak we’d started over five hours earlier, it was a late start for us. The sun was already on the Bells and people lined the lakeshore to get the classic image of the Bells over the water. After passing the warning signs, the trail wound through a quiet and pretty forest. The usually busy trail was surprisingly quiet. The weather forecast was ideal and it was a weekday in September. We knew there was little in the way between us and the summit of Pyramid. 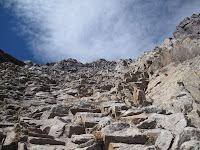 We turned off the main trail and followed the long switchbacking trail toward a notch and spire that guarded the entrance to the basin below Pyramid’s North Face. 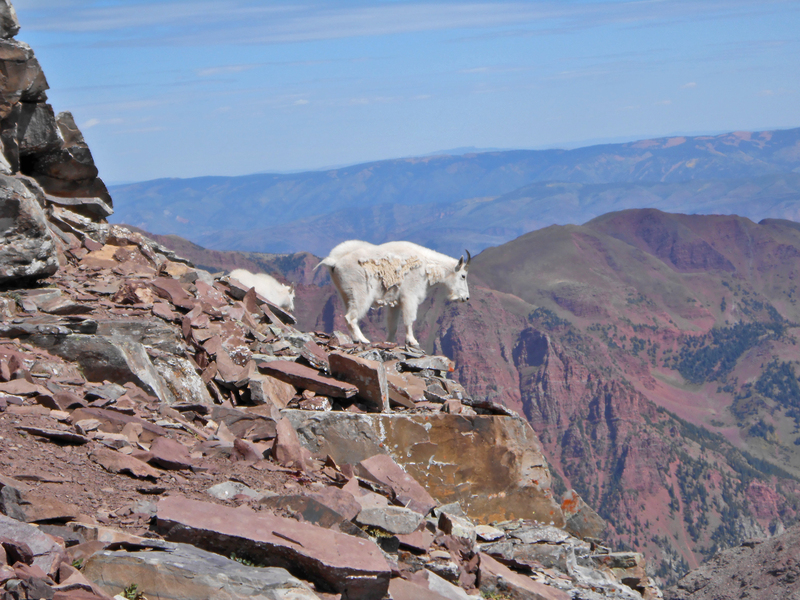 At one sharp switchback we encountered a mother mountain goat and her young offspring standing just off the trail. 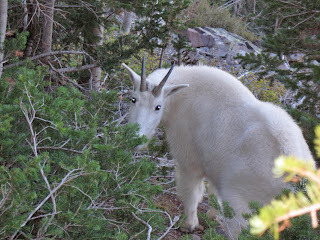 Of course we’d encountered mountain goats before but hardly ever at such close range. Were they aggressive? Territorial? Over-protective of offspring? We passed within a couple feet of the two and continued uphill toward the mountain. Almost two hours after setting out from the car we arrived at head of the rock glacier underneath the shadow of Pyramid’s massive north face. Everything was very quiet. Years of climbing and mountaineering have trained me to look for possible lines and routes up mountains and rocks, but among the cliffs and couloirs on the near-vertical North Face there seemed no likely passage. The greenish-colored rock was simply too broken and horrible to tempt even the more insane members of the “because its there” cult. The approach portion of the climb was over; we had reached the foot of the mountain. Ahead was a long slog 1,000 feet up a steep, slippery scree slope to a saddle where the technical difficulties would begin. We started up the slope at 9 am. Although this steep slope is not the most difficult or dangerous section of Pyramid, it is nonetheless a daunting obstacle, and ascending it took a lot of energy and grunt tolerance for pain and discomfort. By the time we reached the top of it, morning was in full effect. The rest of the climb could now be seen. The broken rock and shattered cliffbands looked less than inviting. After a quick break and morsel of food, we started slowly up the ridge into the danger zone. We reached a cleft in the ridge with a steep headwall and descended left onto Pyramid’s east face. 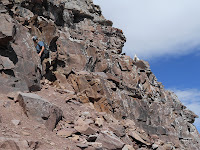 Quickly we reached the Cliff Traverse, a narrow ledge above a steep drop. Although not particularly exposed, one short section required some diligent and careful scooting. A slip would be detrimental. After the Cliff Traverse we scrambled around a corner and across a broken gully to the Green Couloir, the next major obstacle. It was clear that the real scrambling was about to begin. We decided to ascend this loose and dangerous pitch one at a time, eliminating the possibility that we might kick choss on top of each other. I climbed first, ascending about two hundred feet of broken class 3 to a ledge where I could rest and watch my girlfriend and climbing partner come up behind me. A few minutes later she was at my side. We scanned the slopes above us and continued up and right on the green rock. Not far above a set of cairns led us off the green wall to left. A few cliff systems later we reached a bigger ledge with a set of class 4 headwalls above. 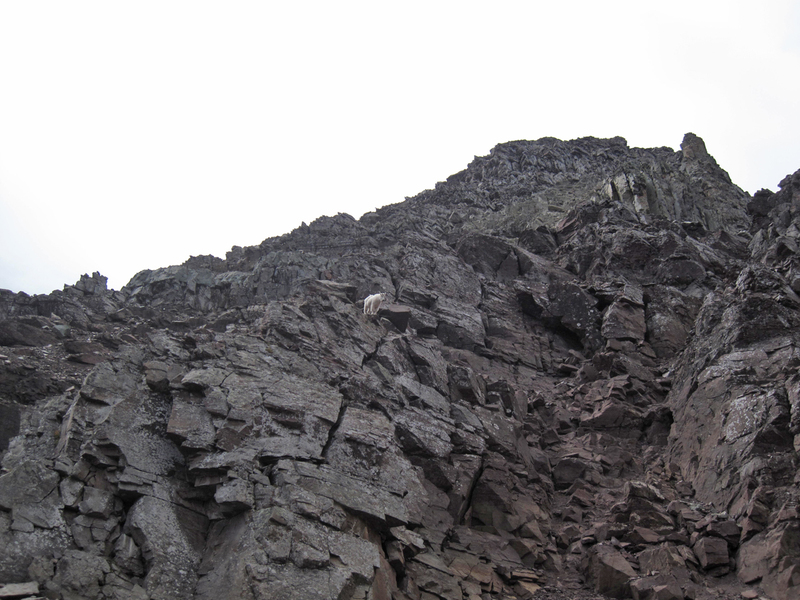 Another mountain goat and youngster stood guarding the top of what was obviously the path of least resistance. I yelled up to her, “Well, that is the way I need to go, so I’m coming up. I don’t want to hurt you.” And I started climbing. Almost as an afterthought, I added “and I hope you don’t want to hurt me either. By bucking me off the mountain or something.” The warning must have worked for the two of them wandered further down the ledge and watched me climb. A few hard moves later at we appeared on the summit abruptly. Pyramid’s summit is fairly small, but we had it to ourselves. A sea of familiar peaks rose around us. We could see Castle, Conundrum, Cathedral, Maroon and North Maroon, Snowmass, Hagerman, Daly, and Sopris. We encountered plenty of mountain goat poop on the summit. We didn’t stay long on top, knowing that we still had a long, loose downclimb in front of us. It was just after 11:30 when we started back down. Tiptoeing through the choss as carefully as possible, we made our way slowly back to the saddle below the hardest terrain. Confident that the worst of our day was behind us at last, I stepped behind a rock to relieve my bladder. A shuffle above me caught my attention, and I looked up to see yet another mountain goat not far above me on a ledge. Watching me carefully (with a look of either suspicion or anger, I couldn’t tell) it lumbered slowly towards me. I stepped back, not exactly sure whether I wanted such a close encounter while in the rather vulnerable position of having my pants unbuttoned. The goat, however, paused and watched me patiently while I finished peeing, zipped up and retreated in haste. The goat lumbered over to where I had just been and proceeded to start licking my urine off the rocks. A little gross, but we assumed he was after the salt, and continued downhill. The next section was the dreaded 1,000’ scree field. It was just as gnarly on the way down as it was on the way up. 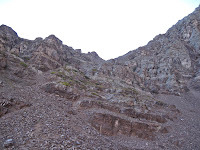 After what seemed like forever of knee-jarring, vertebrae-compressing descending, we arrived at the talus field under the North Face and paused for a rest. Yet another mountain goat ambled by slowly, this one keeping its distance. The things were everywhere! I had never seen so many on a mountain in Colorado. 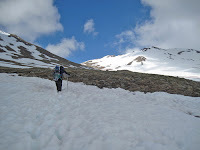 We were tired but a long descent was still ahead, so we pressed on through the rock glacier and emerged on the hill above the amazing valley that hosts Maroon and Crater Lakes. 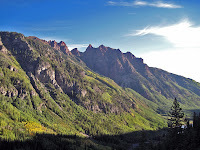 After what could have been forever we emerged on the Crater Lake trail and rejoined the many people out to see the Maroon Bells on a beautiful early fall afternoon. To my surprise nobody commented about our helmets or asked if we had just climbed the peak. Storm clouds were building but we arrived at our car a little after 3:00 pm. We had finally climbed Pyramid. Moaning in growling in exhaustion, we peeled our boots off our feet slipped them into the comfort of sandals. We looked up at the Bells still visible knowing we would be back soon. They were the only 14ers left in Elks that we hadn’t climbed. For now, however, we could turn our backs on the choss pile peaks of the central Elks and head down for a celebratory beer and pizza back home. Nice article with excellent pictures and storyline. My brother and I climbed the northwest side 44 years ago today-July 4th. Everything looks about the same.